UPDATE: I just got a TV yesterday. I just saw a news discussion program that mentioned the images shown here below as being a recent and in response to Koizumi’s recent Yasukuni visit. 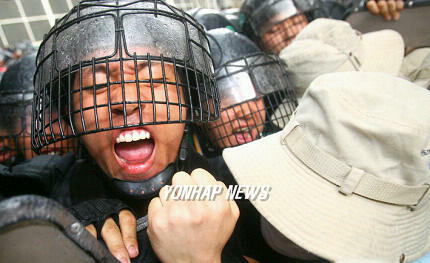 ORIGINAL: ★厳選！韓国情報★ has a a collection of pictures from demonstrations in Korea I have never seen before. There seems to be no note as to when these were taken, but as I said, I have never seen them before, it’s possible they are new and in response to Koizumi’s most recent Yasukuni visit. Do keep in mind that not everyone goes completely wild and crazy, protesting in a more accepted form. See more from the original link. I could be wrong about this, but Bush has never said to Koizumi that he should stop correct? I wish that’s the case with people in the picture but it does not prove anything…by being a part and supportive of those crazy protests, to me, they are collectively responsible for uncivilized acts shown above. I hope that you see the video of prime minister Koizumi’s speech regarding his visits to Yasukuni Shirine. That’s been basically what he has been saying all these years. I don’t think anyone in his or her right mind would be able to protest against his visit to Yasukuni Shrine, if they at least did a due diligence and understood what he has to say. With that said, I would have to think the government, media and people in Korea have grown as bad as they get. Please see the video on youtube.com if you have not. Rose, I saw the video of the interview. Prime Minister Koizumi makes a lot of sense. After listening to him, who could possibly think that he has bad intentions in visiting Yasukuni. I need a translation on that interview. I hope one comes out soon. Anyone here want to sum it up for me. I just got to Japan 2 months ago and my Japanese isn’t so good yet. I myself don’t like Koizumi himself, but these protests seem childish. They only showed to the world that Koreans are not civillized, and that they are barbarians, although I believe there are many civilized Koreans. But these protests may work against them. 8.15 is Independence Day in Korea and Koizumi KNOWS this. Could Koizumi have chosen a worse day to go??? You could only imagine how angered the people of Korea were; it makes it seem like Koizumi was acting rebellious for all these years. As a leader, Koizumi needs to know that he is representing all of Japan and must do what is best for the country. A lot of the politicians in Japan say that it is NOT a good idea for Koizumi to continue visiting the shrine. Japan’s relations with its neighbors are only worsening; sure, all Koizumi needs to do is step down after this one last visit, but the future of Japan’s relations with its Asian neighbors are now in turmoil. As a leader, he needs to think about what’s best for Japan’s future; shouldn’t a leader sacrifice his personal beliefs for the good of the nation? Even the Japanese people are split on whether Koizumi should visit Yasukuni or not. Yet he is in a position that represents the entire country of Japan. And his last visit to the shrine just HAD to be on 8.15 (Independence Day of Korea from Japan)?? That was plain rude. And KOREA is not the only country protesting fervently over Yasukini. So is China. The fact that you only post pictures of protesting Koreans only reaffirm my suspicions that you have some personal feelings towards the country of Korea in particular. I hope one comes out soon. Anyone here want to sum it up for me. Q what is the intention of visiting Yasukuni this time? A Reflecting the past war, we should never bring about the war again.. Some criticize me;I should not visit Yasukuni because China and Korea objected and they are not pleased.. I am for China-Japan,Korea -Japan friendship. I have expanded friendly relation with them in many areas since I became PM.And I am willing to have a summit meeting with them. Is that right diplomacy?.I don’t think so. Every country has some issues, some conflicts between them. Only one issue should not prevent us from having a friendly relation. I am future-oriented. And the development of China and Korea is not a threat for Japan but a chance for Japan. Suppose I say I don’t meet with them because I don’t like China and Korea objecting to Japan becoming the member of security counsel at UN. Who should be blamed? I visit Yasukuni even if Bush says No. :Of course he is not such an immature person,though..
Others say, I should not visit Yasukuni because A criminals are enshrined. I am not visiting for a specific person. I am visiting Yaskuni for people who sacrificed their lives and who have suffered greatly in the war. The article 19 of the Japanese constitution guarantees the freedom of thought and conscience. I think one’s right to them should not be violated just because of the foreign government’s opinion. .I have explained my intention each time I visit Yasukuni, it is okay that there be pros and cons because the freedom of expression should not be violated. Many people advised me to avoid this day.I followed the advice so far. However, I was criticized anyway. Whenever I visit, there are still many who wants to politicize this issue. I ‘ll visit chidorigafushi park later today where a memorial ceremony for the war is carried out. I think today is an appropriate day. You said before visiting on August 15 would cripple the relation with other nations. Aren’t you contradicting yourself? No contradiction. Whenever I visit, there are many people who politicize it. That is okay ,because the freedom of expression is guaranteed. Though I don’t like to politicize it, the media and others who objected to me wants to politicize it whenever I visit. So I realised the date did not matter. yasukuni was crowded with people.So in veiw of security. Do you intend to convey your idea that you visit for the pledge for nor more war and condolescence for the fallen people at the war to China?. Whenever they object, I have explained my intention to them. And I have conveyed my idea that I want to keep friendly relationship and I want the relations to be future-oriented. I have conveyed this idea to China many times. I visited as an individual, not as an occupational obligation. Do you think this visit will influence an election for a next prime minister? It depends on how the media pick up the points of the dispute for the election..
Q what is your opinion of war responsibility of A criminals who are enshrined? They were responsible for the war:they were sentenced as such. I think they admitted it. And as I said many times, I visit Yasukuni not for a specific person but for the whole war deads. Let’s not forget that 8.15 also falls on the last day of Obon, the Japanese Buddhist holiday to honor the departed spirits of one’s ancestors. I really want to understand this issue more. Could you explaine why Japanaese PM should not visit Yasukuni? China has not been reacting the same way as Korea has to the most recent Yasukuni visit, that is why I am not posting pictures of the Chinese doing the same thing in response to this visit. And his last visit to the shrine just HAD to be on 8.15 (Independence Day of Korea from Japan)?? That was plain rude. You only seem to think of Korea but August 15 is special day for Japanese as well. It’s the anniversary of the end of WW II for Japan. It’s nothing more than a domestic affair so you should have a heart to respect it as it is. 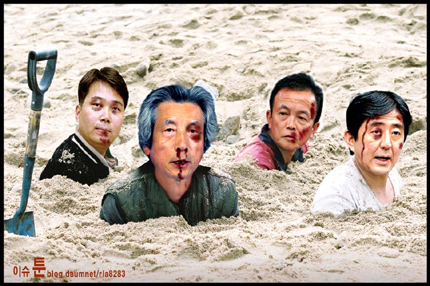 If August 15 is so special for you Koreans, why don’t you just celebrate or do whatever your people would like to do? It shouldn’t be the day to be disrespectful to Japanese and send people to protest in Japan. Being rude is what you guys are in fact doing. You should open up your mind and look around the world. There are only two countries in the world where Mr. Koizumi’s visit to Yasukuni is a major issue. China and Korea. China is just playing a political game over the issue. Korea, to me, is just showing its anger as if it is the only identity they have. I don’t see any valid logical reason why Koreans have to get upset considering the fact that thier ancestor is enshrined at Yasukuni Shrine as well. Koizumi sounds innocent in the interview, but remember that he is fulfilling a campaign promise that helped get him elected. His very public visits, especially this most recent one on August 15, are an appeal to the right-wing and a middle finger to Koreans and Chinese, whose complaints in the past stopped previous prime ministers from going. I don’t oppose his visits, but to pretend that these visits are just innocent prayers for dead souls with no underlying political purpose is naive or dishonest. I don’t give a damn whether JPM visits Yasukuni or not. And I know , for that matter , average Japanese know, he is fullfilling a campaign promise that he would visit Yasukuni. But I wonder what’s wrong with PM fullfilling a campaign promise. It’s the reason behind the campaign promise and its fulfillment – appeal to the right-wing by standing up to Korea and China. The average Japanese is peace-loving and is not proud of Japan’s imperial past, but Japan’s right-wing can be violently extremist. These extremists are the renmants of the old Japan that caused so much death and destruction in the first half of the 20th Century. Will they remain on the fringe or will their ideology become mainstream? Koizumi promised “the bereaved society(遺族会）.to visit Yasukuni. I don’t think he promised extreme rightists. It has become almost compulsory in the Western media coverage of this issue to combine reports with images of strange looking fellows at the Yasukuni shrine, dressed in military garb, but these people are extremists with a tiny constituency. Even rightists hate them. If you have a Japanese friend, have him/her read Japanese blogs. Thuggish rightists are hated by even Japanese rightist. Here is a post by Japanese rightist in English. Here is another one, but in Japanese. Who is the “rightist” that cause trouble in Yasukuni issue? The spy can be very troublesome when he pretends to be somebody else. He enters the organization without anybody noticing it, or pretends to be somebody else and give the damage to the conservative and engages in destructive activity.” I believe that there were spies at Yasukuni and pretended (to be conservative), Some newspaper s make fuss out of it but the true is that there were not such uproar…..there is a rumor that it was set up for shooting. But I agree some of them are thugs, and should be regulated strictly. They are a real enemy of democracy. please let me know since when china and korea started to complain about japanese pm’s or politicians visiting yasukuni? as far as i know, it has not been a long time ago. why did they not consistent? it seems to me some political agenda in china and korea have something to do with it. The pictures above do represent some deep anti-Japanese sentiments among Koreans. In order to understand them it is necessary to study modern history of Korea, and the great difficulties Koreans went through during the colonization by Japan. However, it does seem a bit unfair if anyone is judging Koreans by these pictures. Many Koreans, especially those of new generation don’t hold such strong emotional hatred toward Japan. Not everybody protests in those extreme ways. As for those photoshops, I’ve seen plenty of those stuff on internet about other issues made by people of various nationality.